Since the European Union increasingly come lately message that it is essential to normalize relations with Serbia Kosovo and Metohia, as Brussels does not want to receive candidates who have not resolved their territorial problems. After the completion of cooperation with the Hague Tribunal, the Belgrade authorities do not want to predict when Serbia could actually become a member of the European Union, but are showing that the ideal date would be late. CHRONIC expand in international economic, prepared Mijuskovic Zorica. Belgrade Fall If you get the candidate status of EU association, but also the date for starting negotiations, the process could begin only in the middle of next year. This involves an intense activity to meet 35 chapters, after which follows the signing of an access agreement, and final ratification by the members of the European Union. The experiences of other countries show that this procedure takes a minimum of eight years. 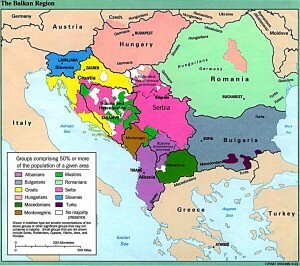 But Serbia has before it a further problem, which had no other countries. After you have completed the cooperation with the Hague Tribunal, it appears that relations between Belgrade and Pristina has become the fundamental problem and that negotiations with Brussels can not be closed until this issue is resolved. But the Deputy Prime Minister Bozidar Djelic, said that nobody in the European Union, officially at least, mentions that the solution of the status of Kosovo and Metohia is a requirement for the application and start the negotiations.According to the press in Brussels and Washington, the main countries of the European Union and United States has not given the “green light” for the actions Hashim Thaci in Pristina latest in northern Kosovo. In contrast, for the first time since the proclaimed independence of Kosovo and Metohija, the international community has sent a protest to the Prime Minister of Kosovo because of their actions and demanded to return to dialogue. However, there is the dilemma of whether or Pristina has embarked on the adventure of assaulting administrative steps and Brnjak Jarinje in northern Kosovo without “external assistance”. Recent events in the southern Serbian province is the most blatant example of that are stepping up pressure on Serbia to recognize Kosovo’s independence. Serbia would not act against their interests in order to obtain the association to the European Union, said Deputy Prime Minister Ivica Dacic.Brussels will never raise the explicit requirement that the independence of Kosovo is a condition for entry of Serbia into the European Union, and that until five of its members do not recognize the southern province there will be consensus on this issue. What is now urgently needed is to halt the escalation of conflicts, so that Pristina return to the negotiating table, where Belgrade is waiting. Analysts expressed fears that any intransigent positions could put in checkmate the Serbian and Albanian. On the one hand, the difficult economic situation influences the mood of voters in Serbia, especially those who are victims of the transition. Moreover, the current Prime Minister of Kosovo and former commander of the liberating army of Kosovo (UCK), Hashim Thaci, is creating quite a spot because it is where he feels safer. For the negotiating table, their arguments are weak, and there may lose all their positions.Moreover, at the global level, the dramatic events in Norway show that the extreme right is becoming stronger in Europe, even in democratic societies with a high standard of living.Such a trend could transfer to the Balkans, a region that has already fallen prey to the radical right. Therefore, the European perspective of Serbia can not come under questions. It is clear that the official Belgrade reacts cautiously to the directives coming from Europe and not experiencing calls from Brussels as a condition or extortion, because membership in the European Union is a strategic interest of Serbia.